Julian Ashton was a painter, teacher and writer whose influence on Australian art and artists was both strong and far reaching. Julian Rossi Ashton CBE (27 January 1851 – 27 April 1942) died at the age of 91. Julian Ashton was a painter, teacher and writer whose influence on Australian art and artists was both strong and far reaching. 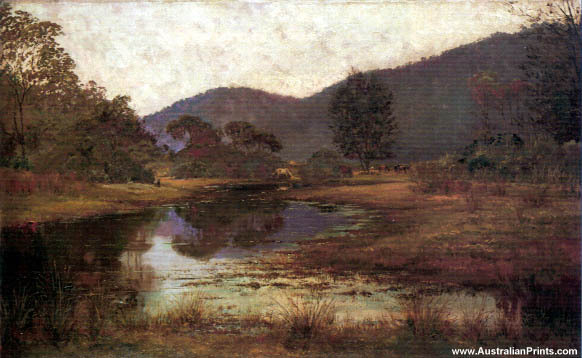 Having Studied in London and Paris before arriving in Australia to work as an illustrator, Ashton was familiar with French Realism and the Barbizon, the springboard for Impressionism. In 1896 he founded the famous Academie Julien, later the Sydney Art School, which attracted artists such as George Lambert, Sydney Long and Elioth Gruner. As a teacher, Ashton always stressed the importance of a solid grounding in drawing, although in his own landscape paintings precise draughtsmanship often subdued by soft, atmospheric effects. (He was also a strong advocate of ‘plein air’ painting). Working in both oils and watercolours, Ashton’s subjects extended from landscape to portraiture to figure composition. Apart from his painting and reaching, his influence was felt through various offices which he held, including trustee of the Art Gallery of New South Wales whose collection of Australian Artworks Ashton was instrumental in establishing. Artist information page for Julian Ashton. This article uses material from the Wikipedia article Julian Ashton, which is released under the Creative Commons Attribution-Share-Alike License 3.0.